A future Labour government would ban fracking in England, shadow energy secretary Barry Gardiner has said. Speaking at Labour conference, he said fracking, which involves gas being extracted from shale rock, would make the UK dependent on fossil fuels when the priority should be clean energy. Labour would focus on developing a low carbon energy industry, he said. 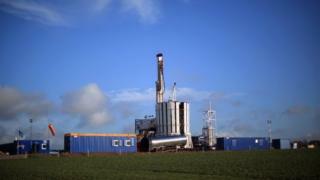 The government says fracking could provide the UK with greater energy security and create jobs. But opponents argue it is bad for the environment and say shale gas projects will make the UK's climate change targets impossible to achieve. Fracking go-ahead: What happens next? In an energy and environment policy launch in September, Jeremy Corbyn pledged to outlaw fracking, saying it was "not compatible with climate change prevention". In a speech to the Labour Party conference in Liverpool, Mr Gardiner confirmed plans for a ban. He said: "Fracking locks us into an energy infrastructure that is based on fossil fuels long after our country needs to have moved to clean energy. "So today I am announcing that a future Labour government will ban fracking. The term fracking refers to how the rock is fractured apart by the high pressure mixture. Mr Gardiner added: "We will consult with our colleagues in industry and the trade unions about the best way to transition our energy industry to create the vital jobs and apprenticeships we are going to need for the UK's low-carbon future." He said the clean energy and low-carbon technologies workforce represented just 6% of the economy but were responsible for 30% if its growth. "We've got to unlock the full potential of this sector," he told conference, saying it meant skilled jobs, growth, clean air and "a healthy secure future for our children". "Britain is at the beginning of an incredible transformation of our energy system. The next Labour government will launch a new programme called 'Repowering Britain' that puts you in control," he added, saying the UK needed to "localise" the way energy is produced and stored. Image caption Barry Gardiner said the focus should be on "clean energy"
Hannah Martin, energy campaigner at Greenpeace UK, welcomed the proposed ban and "democratisation" of energy in the UK. "Support for community energy schemes can empower the people of Britain to take back control from the stranglehold of the Big Six, and choose cleaner and increasingly cheaper energy than the fracked gas and nuclear reactors being pushed by the government." Jesse Norman MP, government minister for industry and energy, criticised Labour's plan to ban fracking, saying it showed the party was "not a credible alternative government". "As Labour themselves have said, the safe development of shale can create jobs and improve our energy security - that's why the government supports shale and will ensure local residents benefit from the proceeds. "Labour are totally divided over how to provide the energy our country needs, and even Labour-supporting unions say their plans 'will not keep the lights on'," he said. Green Party co-leader Caroline Lucas also said Labour's commitment to a fracking ban was "extremely welcome", as the process posed "risks to local communities" and "risks undermining our climate change commitments". But she also urged Labour to "rethink" its support for the Hinkley Point nuclear power plant project. But Gary Smith, the GMB union's Scotland secretary, said ruling out fracking was "madness", saying the UK would be dependent on gas for decades. "We will have to confront the fact that we will be buying gas from hangmen, henchmen and head-choppers. We don't think that's ethical. We have world-class regulators and world-leading standards in terms of monitoring. Ruling it out now is madness," he told the Press Association. Under government plans put out to consultation in August, residents affected by fracking could be paid some of the proceeds of shale gas projects. A shale wealth fund was announced in 2014 to set aside up to 10% of the tax proceeds from fracking to benefit communities in the UK hosting wells. But the government is now considering paying the money directly to individual households instead of councils and local trusts.